Using a strategic framework, students are guided through all of the key drivers of supply chain performance, including facilities, inventory, transportation, information, sourcing, and pricing. 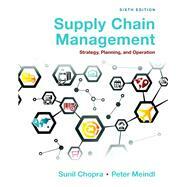 By the end of the course, students will walk away with a deep understanding of supply chains and a firm grasp on the practical managerial levers to pull in order to improve supply chain performance. Sunil Chopra is the IBM Distinguished Professor of Operations Management and Information Systems at the Kellogg School of Management. He has served as the interim dean and senior associate dean for curriculum and teaching, and the codirector of the MMM program, a joint dual-degree program between the Kellogg School of Management and the McCormick School of Engineering at Northwestern University. He has a PhD in operations research from SUNY at Stony Brook. Prior to joining Kellogg, he taught at New York University and spent a year at IBM Research. Professor Chopra’s research and teaching interests are in supply chain and logistics management, operations management, and the design of telecommunication networks. He has won several teaching awards at the MBA and Executive programs of Kellogg. He has authored more than 40 papers and two books. He has been a department editor for Management Science and an associate editor for Manufacturing & Service Operations Management, Operations Research, and Decision Sciences Journal. His recent research has focused on understanding supply chain risk and devising effective risk mitigation strategies. He has also consulted for several firms in the area of supply chain and operations management. Peter Meindl is a portfolio manager with Kepos Capital in New York. Previously, he was a research officer with Barclays Global Investors, a consultant with the Boston Consulting Group and Mercer Management Consulting, and the director of strategy with i2 Technologies. He holds PhD, MS, BS, and BA degrees from Stanford, and an MBA from the Kellogg School of Management at Northwestern. The first edition of this book won the prestigious Book of the Year award in 2002 from the Institute of Industrial Engineers.